Many football fans follow the sport religiously, and Father Christos Mitsios is no exception. The 51-year-old Greek Orthodox priest has become a mainstay in the hard-core section at PAOK Thessaloniki matches, cheering on the team and offering help and guidance to many of Greece’s most fervent supporters in the fearsome Gate 4 section of the Toumba Stadium. “Gate 4 is magnificent. These boys have a fire inside them, in their heart and soul,” says Father Christos. “I will always stay with the drug addicts, the hooligans, and those abandoned by society and their own families. “It’s the abandoned who often have more principles and more heart than those that appear respectable.” Father Christos does not go unnoticed at matches in the northern Greek city, where he went to theology school years ago. His flowing gray beard and full-length black cassock set him apart from the bare-chested ultras who attend every home match, but it is with them that Father Christos says he can do the most good. The church’s conservative hierarchy is less than amused with Father Christos, and the images of him, all smiles, being carried on the shoulders of boisterous youths, or chanting slogans with a black-and-white scarf tied around his neck. Church elders stripped Father Christos of his administrative responsibilities, angry at his blunt refusal to stop attending matches. But a campaign with 18,000 followers launched on Facebook last year helped insure that his punishment stopped there. 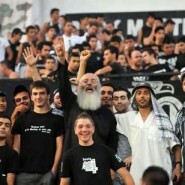 Fans routinely post clips of “Papa-PAOK,” as he is known to the club’s faithful, on YouTube, one showing the bespectacled priest holding up a flare and chanting “PAOK I live and breathe only for you.” Others show his car being stopped in the street by supporters who erupt in spontaneous chants of admiration. Father Christos said he is happy with all the attention if it means he can help children who would otherwise ignore the church. “The other day, about 20 motorcycles pulled up to my church, and they were all fans seeking confession,” he said. “I probably do between 1,000 and 1,500 confessions each month, and 80 per cent of those who come are below the age of 30. I’ll sit with them, give them food and drinks, and we’ll discuss their problems until the morning.” Tonight, PAOK will be playing in one of their most important matches ever, facing Ajax at home in the second leg of the third qualifying round for the Champions League.